Maytham Steam Ship Co., Buffalo, NY. 19, 32, 52 x 45" engine, 800HP, 83RPM, King Iron Works, Buffalo, New York, 1892. 12 x 12' scotch boilers, 160 pounds steam, Lake Erie Boiler Works, Buffalo, 1892. 1892, Nov 1 Enrolled Buffalo, NY. 1893, May 26 Collision with towed schooner F.A. GEORGER at Sugar Island, Sault Ste. Marie. 1893, Jul 3 Struck an obstruction by Cedar Point, Sault Ste. Marie, sunk in 15 - 17' water at head of the canal. 1897 Owned John Kelderhouse, Buffalo, NY. 1900, Jul Ran on rocks, Milwaukee, WI. 1903 Owned J.C. Gilchrist Transportation Co, Cleveland, OH. 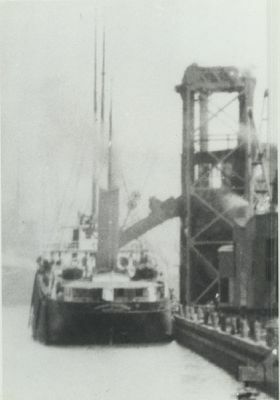 1910, Jun Collision with EMPIRE CITY off Chicago breakwater. 1916 Owned General Transportation Co, Cleveland. 1924, Nov Struck bridge, Chicago. 1926, Nov Stranded Keweenaw Peninsula, Lake Superior, released by tug FAVORITE. 1930 Owned General Transit Co, Cleveland. 1933 Owned Maytham Steam Ship Co.
1935 Abandoned, Fairport, OH & dismantled. 1937 Rebuilt Rochester or Pittsford, New York as twin screw, diesel engines tanker; renamed DOLOMITE NUMBER 2, owned Dolomite Marine Corp.
1941 Sold off Lakes, renamed MOTOREX.